The 3-member Commission was headed by Santiago Canton of Argentina. It urged Israel to investigate all the killings and injuries inflicted by its soldiers against participants in the march. But it also urged the UN’s High Commissioner for Human Rights to provide the dossiers on alleged perpetrators to the International Criminal Court (ICC) and other bodies. The Commission’s full report will be issued on March 18. The videos and infographics in this blog-post come from a web portal highlighting the Commission’s work that’s on the UNHRC’s website. Warning: video contains disturbing scenes of protesters being shot and killed. In the preliminary version of the report, the Commission noted that during the period March 30 through December 31, 2018, Israeli soldiers had killed 189 unarmed demonstrators, 183 of them with live fire, and had injured 9,204 others, two-thirds of them with live fire. During the demonstrations, four Israelis soldiers were injured with stones or explosives. Release of these two versions of the Commission’s report is extremely timely as March 30 will see several big actions in various locations to mark the first anniversary of the Great March of Return (GMR), a massive campaign of nonviolent citizen protests that demand the lifting of the siege that Israel has maintained around Gaza for 13 years, and the implementation of the Palestinians’ Right of Return. What coursed through the mind of the Israeli sharpshooter as they zeroed in on Dali, decked out in cycling paraphernalia, through the scope of their high-powered rifle? That here was an opportunity to deprive a Palestinian of his possibly sole enjoyment in life, already so precariously deprived and circumscribed by a brutal and unrelenting blockade? Or, consider the fact that the commission received testimony from many young Palestinian men and women whom Israeli snipers shot in the lower abdomen and groin, rendering them incapable of having children. Was this pattern a coincidence or did certain Israeli soldiers view Palestinians in such a dehumanized and racist fashion as to judge their reproductive capacity a “demographic threat” to continued Israeli Jewish supremacy? On May 14, 2018, hundreds of US and Israeli officials and dignitaries jubilantly gathered outside of 14 David Flusser Street in Jerusalem to witness the Trump administration make good on a key campaign promise: to move the US Embassy to Israel from Tel Aviv to Jerusalem. That move upended seven decades of a bipartisan US policy that had consistently refused to recognize any country’s claim to sovereignty over the city and enraptured Trump administration figures, GOP donors, Members of Congress, and Bible-thumping televangelists who attended the ceremonial opening . Just 60 miles away, in the Israeli-occupied and -besieged Palestinian Gaza Strip, an entirely different and horrific scene was unfolding. An estimated 35,000 to 40,000 Palestinians protested at 13 sites throughout the enclave in the planned culmination of the GMR, which had initially been planned to last only six weeks. The GMR protests that day took on added urgency and intensity as the Palestinian demonstrators were also protesting the US putting its imprimatur on Israel’s exclusivist claims to Jerusalem and preparing to commemorate 70 years of the Nakba (“catastrophe”), the dispossession of the indigenous Palestinian population and colonization of Palestinian land that has characterized Israel’s policies since 1948. 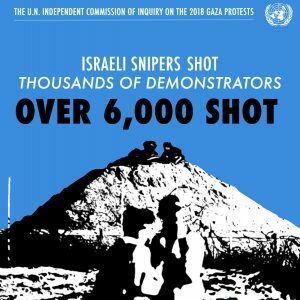 Israeli snipers had made liberal use of shoot-to-kill rules of engagement during the protests of the preceding six weeks, maiming and killing unarmed Palestinian protesters who posed no imminent threat to soldiers often stationed hundreds of meters away, secure behind rows of barbed wire, fences, and earthen berms. But no one seemed prepared for the ferocity of Israel’s onslaught on May 14. There was a constant stream of bloody bodies being carried back towards the ambulances. It was surreal and endless. It became almost normal, it was happening so often. A shot, a person falling, people carrying the body away… The number of wounded was astonishing. I couldn’t say how many people I saw who were shot because it was so high. I have covered wars in Syria, Yemen, Libya. I have never seen anything like this. The slow methodical shooting. It was just shocking. In total, Israel killed 60 Palestinians that day and injured 1,162 people with live ammunition. One of those killed was Mahmoud Jundya, a 20-year-old journalism student from Gaza City, who was filming the protests 50 meters from the fence separating the Gaza Strip from Israel when an Israeli sniper shot him in the leg. As he lay on the ground injured, Israeli forces shot him dead with a bullet to his back. The Commission concluded that Israeli forces “killed and gravely injured civilians who were neither directly participating in hostilities nor posing an imminent threat,” which is a war crime. Moreover, these killings occurred “in the context of a widespread or systematic attack directed against a civilian population pursuant to or in furtherance of a State or organizational policy,” and may, therefore, constitute crimes against humanity as well, according to the commission. It is no wonder that Israel refused to cooperate with the work of this Commission, as it previously refused to provide access to previous UN fact-finding missions investigating Israel’s earlier military assaults on the Gaza Strip and the seaborne attack Israel launched against a flotilla of civilian ships attempting to deliver humanitarian supplies. However, Israel’s efforts to derail this Commission did not inhibit the Commission from conducting a comprehensive investigation. The Commission conducted 325 interviews with victims, witnesses, government officials and members of civil society and reviewed more than 8,000 documents, including affidavits, medical reports, open source reports, social media content, written submissions and expert legal opinions, video and drone footage, and photographs. Nor was the Commission one-sided, as is often falsely alleged by Israel and the United States in an attempt to discredit the findings of UN investigations into Israeli atrocities. It acknowledged that some Palestinians engaged in acts of violence, that some Hamas leaders employed unspecified “inflammatory” language, and that damage had been wrought to Israeli property by incendiary kites. The vast differential in the impact of Israel’s response to the Great March of Return—the UN commission noted that four Israeli soldiers were injured by stones and explosives—is testament to Israel’s disproportionate and indiscriminate use of force, not the UN’s partiality. During the Obama administration, the United States colluded with Israel to bury UN recommendations to hold Israel accountable for atrocities committed against Palestinians in the Gaza Strip as I documented in my book Shattered Hopes: Obama’s Failure to Broker Israeli-Palestinian Peace, published in 2013. For example, in 2009, US Ambassador to the UN Susan Rice schemed with an Israeli counterpart on the “best means to deflect and contain the Goldstone report,” documenting Israeli war crimes committed during Operation Cast Lead, according to leaked documents. And when Israeli naval commandos executed US citizen Furkan Doğan aboard the Mavi Marmara in 2010, the State Department meekly deferred to an exculpatory Israeli investigation and dropped any pretense of holding Israel accountable for the killing. With the Trump administration populated by end-of-times Christian Zionists such as Vice President Mike Pence, and with financial backers of Israeli settlements such as David Friedman, Jason Greenblatt, and Jared Kushner now formulating US policy toward Israel and the Palestinian people, it is impossible to believe that it would act on the UN Commission’s recommendation to impose “individual sanctions, such as a travel ban or an assets freeze, on those identified as responsible” for war crimes and potential crimes against humanity documented by the commission. However, with the anniversary of the Great March of Return approaching, action could and should now be taken by Congress to investigate whether Israel used US-manufactured weapons to commit these war crimes in violation of US laws, and to sanction Israel if it did so, as required by the Leahy Law, Arms Export Control Act, and Foreign Assistance Act. Josh Ruebner is the author of Israel: Democracy or Apartheid State? and Shattered Hopes: Obama’s Failure to Broker Israeli-Palestinian Peace. He is former Policy Director of the US Campaign for Palestinian Rights and Analyst in Middle East Affairs at Congressional Research Service.